Thank you for asking me to appraise this French clock for you. I will give you my opinion based on the four photos, but it would have been helpful to provide some information that you gleaned from viewing the piece and perhaps taken a photo of the movement. still it is my pleasure to try to be of service. 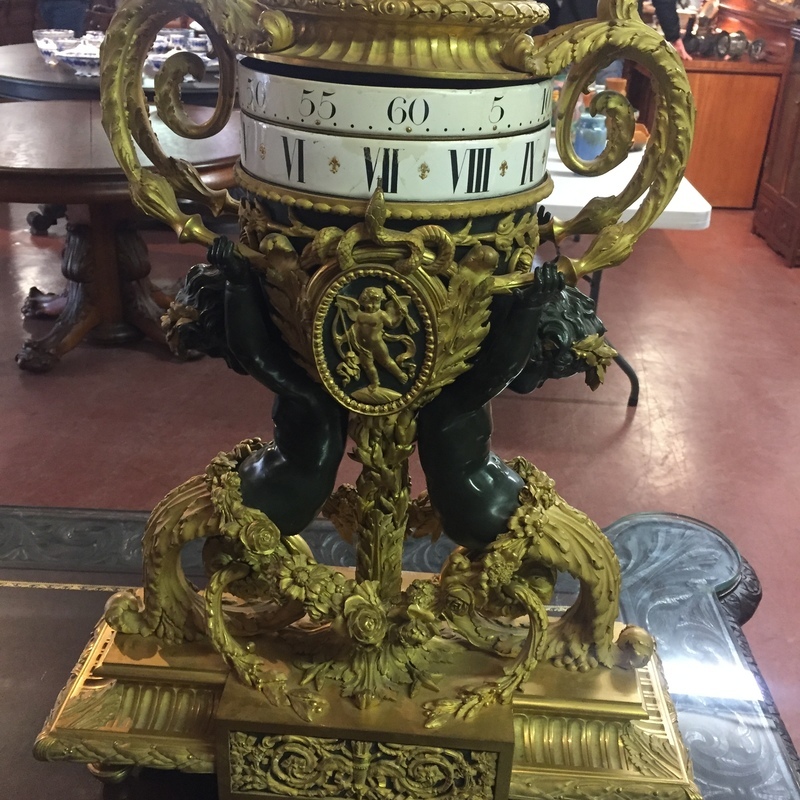 . .
Art Nouveau era, Dore bronze, ormolu and patinated bronze figural vasiform-urn mantel clock, 'Pendule a Cercles Tournants', in the style of Louis XVIth, not known if signed, made in France late 19th century. . .
CASE: Approximated at 12” +/-, this is a Dore bronze capped urn in a vasiform shape with foliate decorated gilt cap having a flame finial at the top. Curled elaborate gilt acanthus leaf handles attach to each side of the urn. The two patinated bronze cherubs with gilt floral headdress support the large urn on their backs. The urn has fluting below the cap and aced just above the two circular white enameled bands with the Roman hours chapter ring below, and the Arabic minute ring above. Gilt Fleur-de-Lys half hour markers are present, and in the Egyptian style, a gilded serpent head points to the time. In the lower half of the vase there is a medallion shaped cameo of a golden Cupid with his bow and arrows flanked by laurel leaves. The ormolu decorated central post supporting the clock is ornamented with a French lance leaf decoration. The post terminates in a bouquet of gilded roses which intertwine with two Dore bronze cornucopia to either side. It is from the cornucopia that the two patinated bronze cherubs emerge to hold the urn. All rest on a gilded rectilinear platform base with concave stylistic lance leaf molding below having a projecting frieze on the facade with foliate and floral forms, all in an architectural style resting on several gilt toupie type feet. It is the stressing of floral and foliate forms throughout this piece that suggests the Art Nouveau era in Europe of 1880-1910. . . DIAL: The twin revolving chapter discs of enameled plate rotate on a brass cylinder and the time is indicated by a serpent head as noted in the case discussion. . .
MOVEMENT: This is of utmost importance and is not shown. We do not know whether it is signed or not. It should have a signature if the clock is to have significant value, and the lack of seeing the movement and signature is why I have given you such a wide range in the fair market value, the higher value is if the clock movement is signed. The movement sits within the vase shaped urn and essentially is the traditional round solid brass plate French movement of the 19th century turned on its side, utilizing a platform cylinder/balance wheel escapement (instead of an anchor escapement with spring hung pendulum). Some examples have a countwheel striking system if this is a time and strike clock. Some are time only, although in the late 19th century most are time and strike. The back plate of the movement (facing upwards) should be stamped with the name/location of the clockmaker or at least have a foundry mark, perhaps with a model number. There are usually metal arms, in the early examples looking very much like the blades of a fan, that connect the gearing to the brass cylinders that turn the hour and minute annular rings. . . Condition: In very fine condition with minor signs of wear on the white enameled annular rings, in fact, a small hairline is seen at the 28-minute marker with another hairline at the seventh hour with several areas of discoloration and darkening in the white parts of the dial. I can see a small chip as well. I cannot see any signs of real age on the gilding over the remainder of the case or aging or damage to the patination of the figures. The gilding does NOT appear to be redone, and appears genuine, at least in the areas I can see. The earlier examples used fancy porcelains and marble for decoration. I have given you a fair market range from $12000 (unsigned) to $25000 if the movement is honestly signed. This is a very difficult clock to evaluate from a few photos and the movement is very important to see. The movement would show definitive signs of age as well, simply because it is not polished and cleaned like the case surface has been. It has been a pleasure to attempt to appraise such an impressive clock.